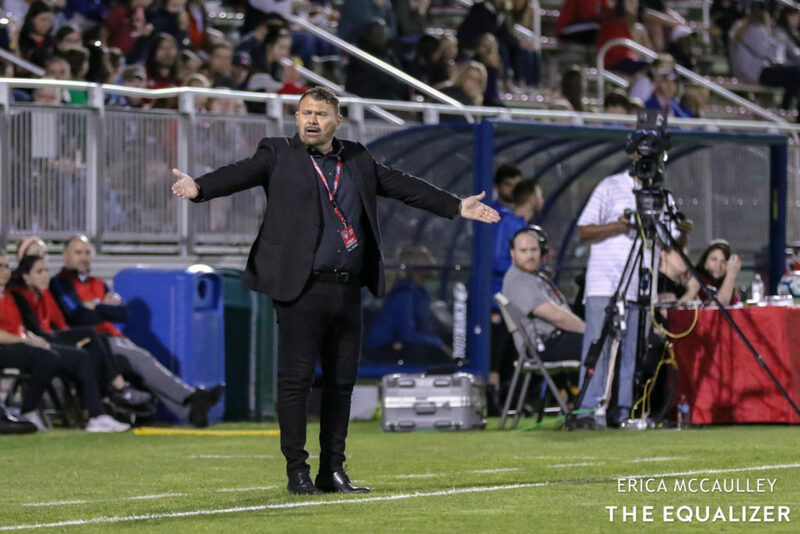 One of the major talking points heading into opening weekend the National Women’s Soccer League was how the three teams with new coaches would perform: the Washington Spirit under Richie Burke, the Orlando Pride under Marc Skinner, and the Houston Dash under James Clarkson. The new hires were met with mixed reactions, from excitement (Skinner) to skepticism (Burke). While it can take an entire season or even more to get the true measure of a coach, each team’s season opener gave us a few clues as to what we’ll be seeing this year. Joy in Washington … or not? On the stat sheet, Washington had a great game. They dominated Sky Blue in every column except duels won and translated that to the scoreboard, easily claiming a 2-0 win. Fans have every reason to be pleased with the performance; the Spirit were energetic, eager, and played with a clear game plan that involved quick passing and high pressure. The win, and the goals that earned it, were a far cry from last year’s team that played like they wanted to be anywhere but the field on which they played. The change in not only the coach but majority ownership, and the subsequent off-field improvements, seem to have breathed new life into a Spirit team that has been free-falling since they lost the 2016 NWSL championship. But – yes, there is a but – we’ll have to wait to make a call on whether or not the new Spirit can find a new place on the table. Quite simply, Sky Blue wasn’t enough of a test.